Beware of arborists that use spikes while climbing your trees to trim or prune them. The use of spikes can result in long-term damage to your trees. If you’re searching online for “tree trimmers in my area,” no matter which Charlotte tree service company you choose, make sure to keep this in mind. If not done properly, tree trimming can end up damaging your trees and shortening their life. 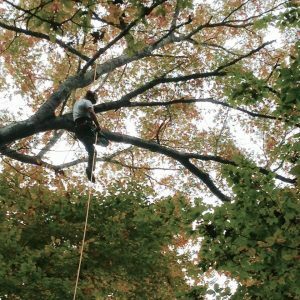 Our tree care company in Charlotte NC specializes in non-invasive, spikeless tree trimming and pruning, ultimately preserving the health and life of your trees and ensuring they stay in the best possible shape for future growth. Tree pruning in Charlotte provides many benefits. It brings a more aesthetically pleasing look to your landscape. If you have a large canopy of trees blocking the sun, it can also allow more sunlight to shine on your lawn, improving the life, color and quality of your grass and shrubs. Large branches may fall or shift unexpectedly if not cut correctly. Attempting to cut a branch with a chainsaw can result in kickback, which may lead to injury. Amateurs may leave too much of a stub on a major branch, making it susceptible to disease or insects at the point of entry. If you hire an unlicensed tree care company you could be held liable if a worker injures himself while on the job. There are many cited instances of tree service providers causing damage to fencing, gutters, roofing, etc. and disappearing, never to be seen again. It’s important to leave tree trimming and pruning up to the experts. Our staff of certified Charlotte arborists is not only knowledgeable and experienced in the tree care industry; we are also fully certified and insured and will treat your landscape as though it’s our own. We take the health of your trees and landscape very seriously. The beautiful oak or crepe myrtle in your yard will look even more beautiful and last longer with proper tree trimming and maintenance. Tree pruning Charlotte NC is a finely-tuned art. Make sure you hire a professional arborist to take care of your local tree trimming needs. We provide FREE estimates by phone, email or on-site. Simply give us a call at 704.207.0842, or fill out the form on this page and one of our tree service experts will be in touch soon!